Google was not the first search engine to hit the internet. Yahoo predated Google considerably. There were AltaVista and AskJeeves in the late 90’s that did a fair job of digging out data from the not-so-obscure corners of the World Wide Web. It was in 1998, with the entry of Google on the scene that search, as we know it, changed forever. With its revolutionary PageRank algorithm, Google found near-magical ways of hunting down exactly the right data that you needed in a fraction of the time that its competitors took. Today with nearly 75% of all search traffic being routed via Google, there is no question of who rules online search. With Google spoiling all of us for good, internet users by and large have come to expect a similar level of excellence in all forms of search that they encounter online. One of the key components of “other forms of search” is site search. Are there any lessons that on-site search functions can steal from Google’s phenomenal success? Let’s take a look at the four most critical takeaways from Google’s search juggernaut. One of the hallmarks of a search experience on Google is the autocomplete or autosuggest feature that offers suggestions for your complete search term. Based on the millions of search requests Google receives every single day, it has developed sophisticated predictive models that help users speed up their search process. Very often, results begin to be populated even before the user hits the Search button. 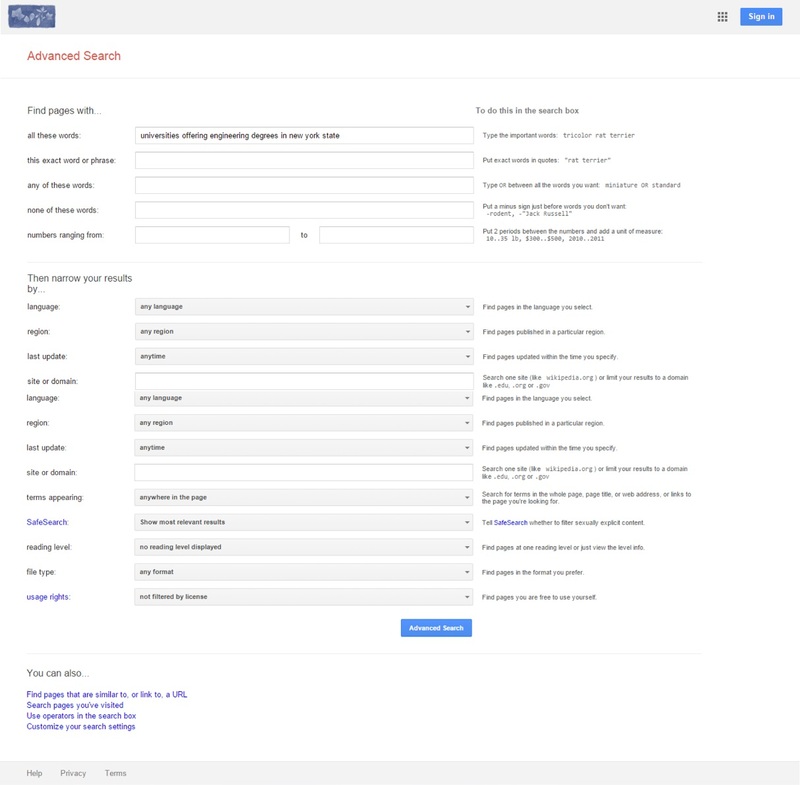 A site search engine that offers autocomplete helps users in not just speeding up their search process. It also offers users clues on all related data or products that it carries. This is helpful while searching on a new site where the user limited knowledge about its contents. Algolia is one of the best tools that enables you to do this. Site owners can index their database with an API and then relevant search results show up on-site in real-time. The auto suggest even has the ability to correct typos. Isn’t it great when Google can offer results for nearly every kind of query you can think of? It’s almost as if they can read your mind and just know what you need answers for. The idea behind semantic search is to mimic and understand natural language instead of relying purely on keywords for securing results. 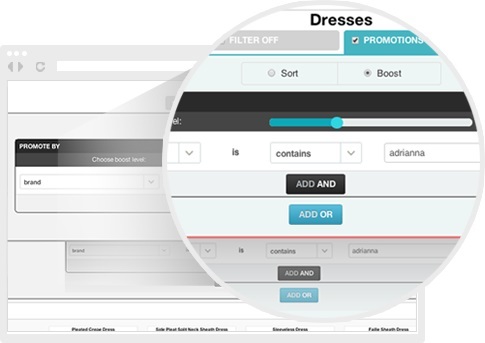 Semantic search is pinned on two key pillars – user intent and context. Use these two key insights into your site search to offer users more useful and clearly filtered search results. 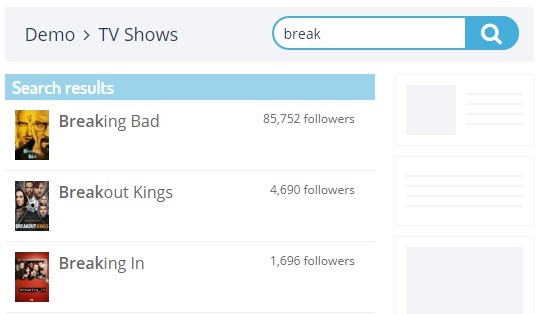 Instead of treating each word entered into your search bar as standalone terms, configure your site search to see the context behind the phrase entered by the user. 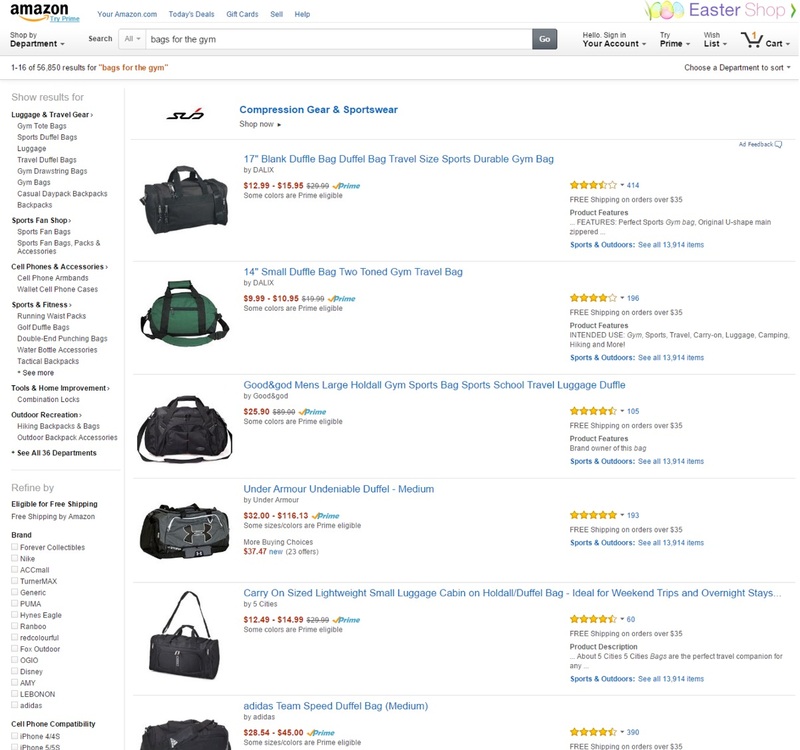 For example, when I search for “bags for the gym” on Amazon and Zappos, the difference in results is astounding. Amazon clearly understands the meaning behind my search term and serves up exactly what I had in mind – gym bags. 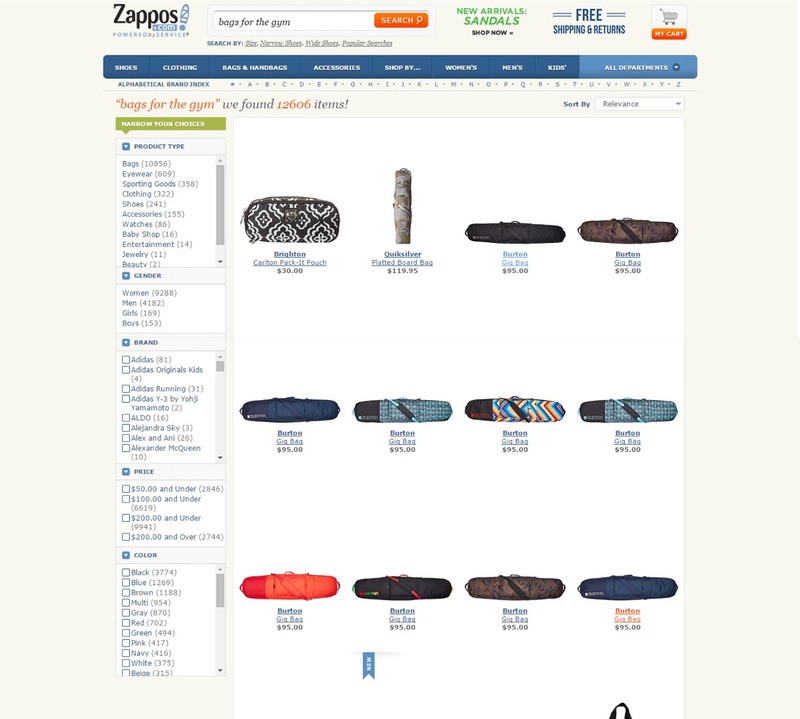 On the other hand, Zappos is completely clueless about the real intent behind my search and uses the words “bag” and “gym” in completely unrelated contexts, to end up with a mixed bag of irrelevant results. Which site do you think a shopper would end up buying from? Celebros provides what they call “concept-based semantic site search” by understanding whole queries instead of breaking down the whole phrase into words, as traditional, string-based ecommerce search engines try to do. 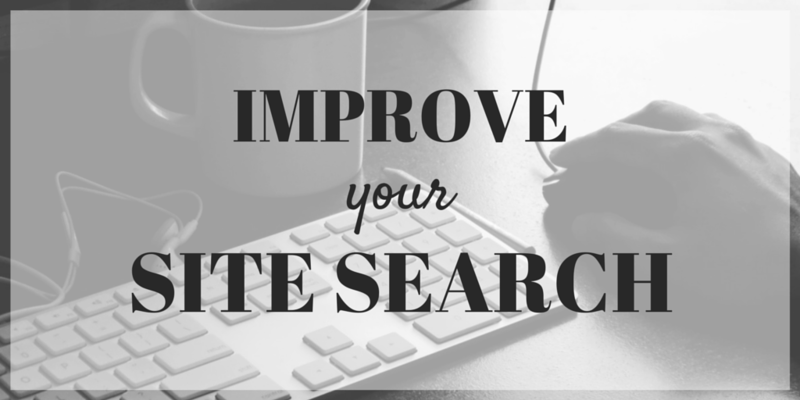 The result is dynamic and highly-relevant output for the searcher. Everyone likes being treated special. With the advent of Big Data and thousands of tools to tap into it, personalized results are the bare minimum users have come to expect when they search for anything online. Personalization ranges from a customized salutation to completely tailor-made search results for each user. Google personalizes results very distinctly based on past searches. It “learns” what the user is interested in and shows only relevant results according to its pre-existing knowledge about the user. This is visible on any regular Google search, but becomes more pronounced when you sign in to your Google account and then search. In the latter case, Google digs deep into your past search history, picks up articles that have been liked or shared by our friends and social connections and ranks such results higher than other results. By controlling the degree of personalization and the exact amount to which specific items need to be merchandised on your site, a personalized site search solution offers you the benefits of personalization combined with highly relevant search results. This is a core benefit of Google’s search tool. While your everyday searches like “today’s temperature in New York City” gives straightforward results, a search phrase like “universities offering engineering degrees in New York State” opens up a world of possibilities from a result filtering perspective. One can zero in on results from a particular geographical region (New York State, in this case) or filter out results that appear in specific languages (everything, but English), and many more such criteria. 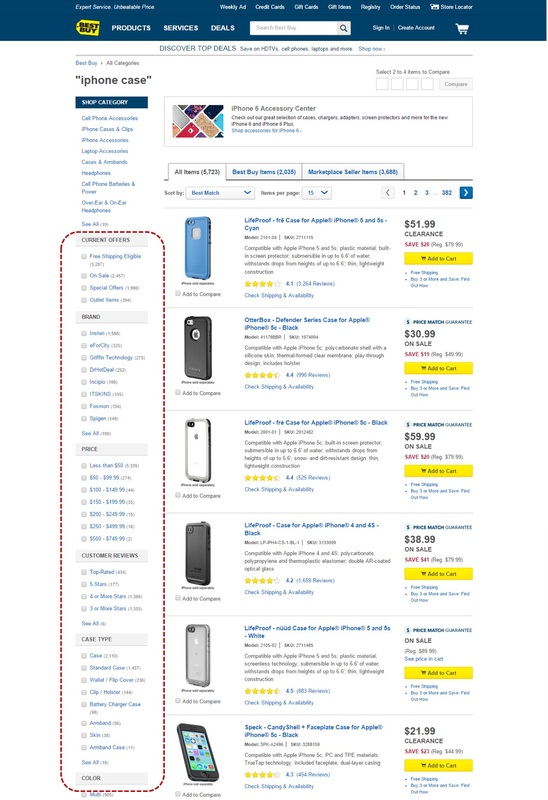 However faceted search is not limited to e-commerce sites alone. Non-ecommerce sites too realize the importance of user control on the results that are served up and offer users the ability to refine their results to a granular level based on their individual constraints. I especially like the way the New York Times and Mail Chimp handle their faceted search. 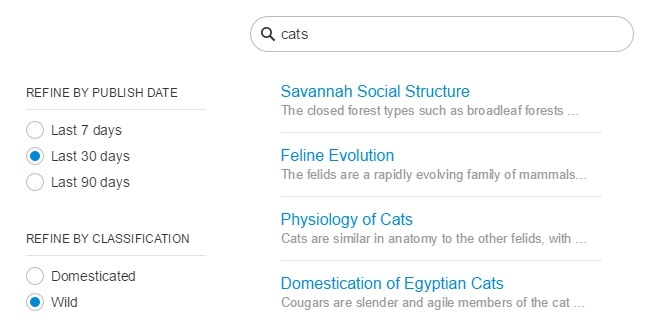 While the New York Times offers a much deeper level of filtering results, MailChimp keeps its advanced search simple and lets users pick content from their support pages or blog or both. The fact that the MailChimp version of search does not feel too constricted shows that what matters in an advanced search within site search is not the number of options you present to your user. What really matters is how relevant each filtering option is to the user and whether all your options put together cover all possible granular options that a user can dig into. If you want something similar for your site, the Y Combinator-incubated app Swiftype has a good faceted search solution, which allows you to quickly refine your results by date, author, location and content types. As a vital component of your website element mix, site search truly has the potential to drive solid results for your business. According to data from eConsultancy, site search converts users at almost double the rate of a website’s average conversions. Depending on the particularities of your niche, weight down your options and choose the solutions that best fit your needs. Learn from the leader in search and reap the benefits of higher conversions and greater user stickiness. It’s both true and useful for websites or any search engine integrated to a software (cloud or on-premises). Great post, thank you!